Been 10+ years since Mama and Papa Chan had been to Bangkok. There was a lot to cover in one weekend: BTS, new shopping malls, night markets and of course, all kinds of great eats. After catching up with phad thai, som tum and mango sticky rice, we headed for something slightly different. 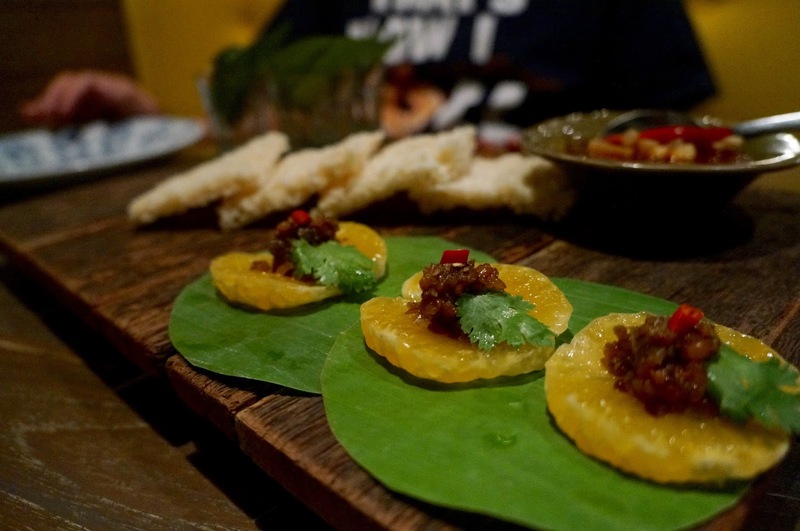 Supanniga Eating Room serves dishes rooted in Isaan and Northern Thailand. Just a brisk 10min walk from Thong Lor BTS station, the 3-storey dining room was chic and modern with raw earthly exposed walls and contrasting vibrant yellow seats. With a mixture of foreigner and young local clientele, the ambience was laid-back and youthful. We started with a beer each and chose recommended dishes from each section of the menu. The trio of appetiser was an excellent sample platter. The sugary sweet juice from the tangerine slice mingled well with the savoury garlicky mince and neutralised the sharp kick from the chilli. 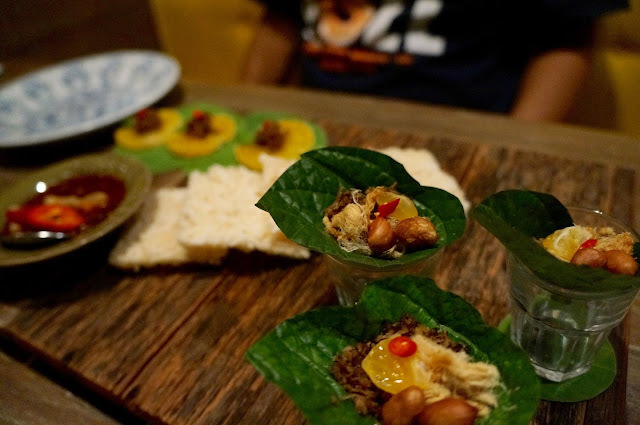 The cha plu leaf parcel was my favourite, with pork floss, sweet roasted coconut shreds and crunchy peanuts. The dip served with rice cakes looked viciously hot, but it started sweet with aroma from dried shrimps and pork crackling, the heat crept in slowly and lingered as an aftermath. The marbling of the beef more tendons than fat, so some slices was quite springy, while others with a lot of tendons were sinewy and inedible. The dressing was a good balance of savoury, sweet, sour and spicy, provided we scrape all the chilli seeds from the meat. 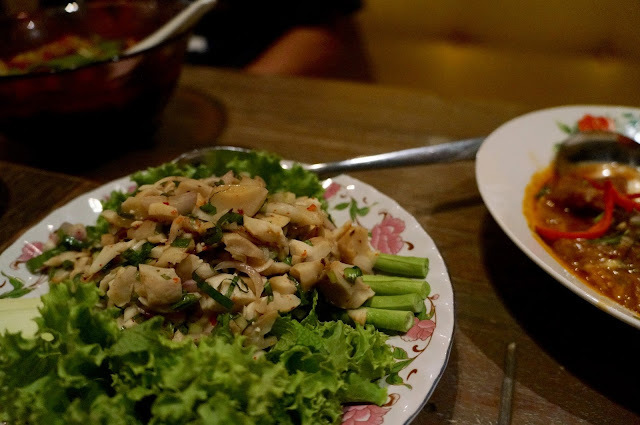 Larb is a salad mixed with lime juice, fish sauce, crispy toasted rice, chillies and peppermint, served with an assortment of vegetables. It was a juicy dish with plump mushrooms and a tangy, fragrant minty dressing, the chilli was relatively gentle (or my tongue had been rendered senseless by now). 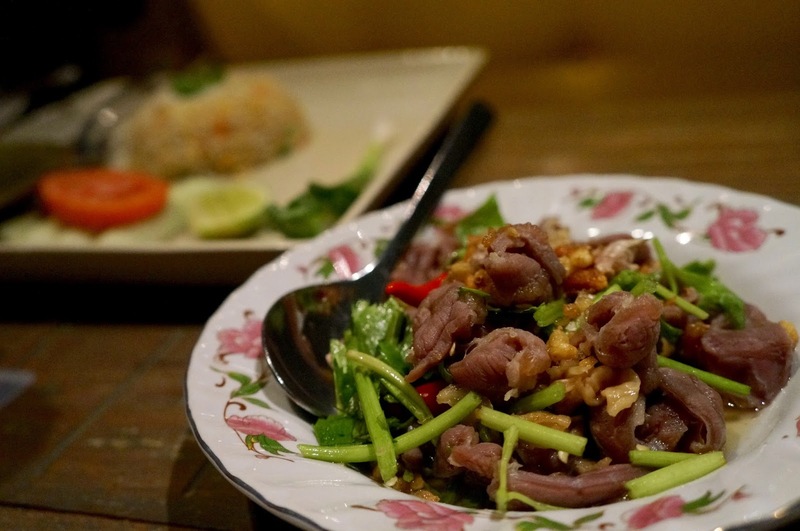 The vegetarian version is undoubtedly less flavoursome than the minced pork larb though. This seemingly innocent broth started with a refreshingly citrus tone, then the force of chilli tsunami suddenly hits. 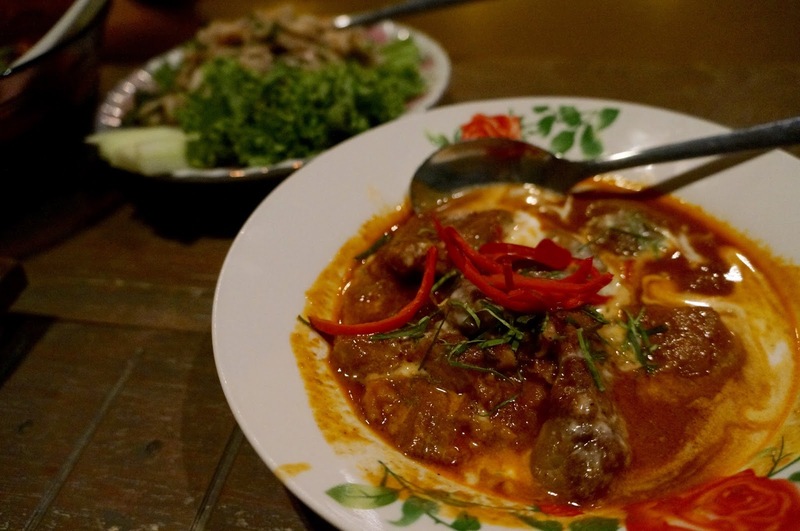 This wasn't a regular spicy dish; it was eye-watering, head-scratchingly hot. The heat just wouldn't disappear, it continued to poke and assault my tastebuds long after the chunks of minced fish meat had been washed down with Singha beer. The fish and Thai aubergine had thoroughly absorbed the chilli essence, leaving a burning sensation in my throat. 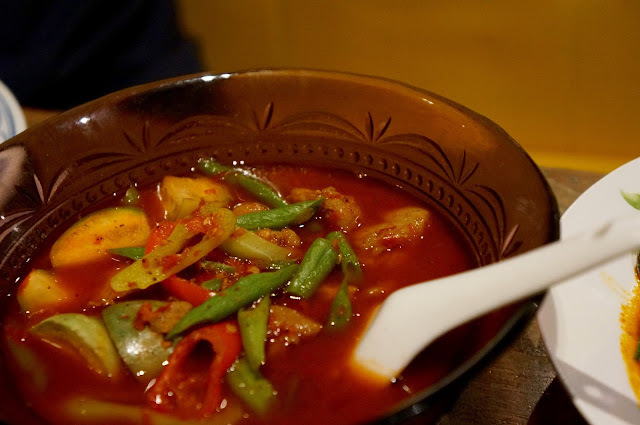 It reminded me of the iconic Sichuan water-cooked fish - but hotter, much much hotter. I may have a low-moderate spice tolerance, so this could simply be a gentle tingle on the tongue to others. By contrast the red curry beef was much milder. The curry was not as sweet as some of the other red curries I have had before, but it was still flavoursome and packed with coconut fragrance. Despite the relatively dainty portions, there was plenty of beef shank. The pieces with meat with more tendons were softer after the slow cooking, leaner bits were slightly coarse and chewy, but it was quite good overall. We enjoyed our dinner at Supanniga Eating Room, despite the potential of some permanent damage to my oesophagus. It was a nice change from the street eats we usually have. Yes that jungle curry was off-the-scale spicy, but all other dishes were a blend of smooth and powerful flavours with careful balance. It’s definitely a spot worth checking out for delightful dishes that are less common elsewhere in the capital.